Highlights include: Learning Conferences (parent-teacher interviews), FUNANZA, BoT updates, middles swimming sports … and much much more! 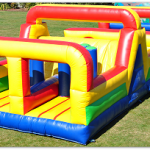 Bouncy castles are just one of the many activities at this year’s FUNANZA. Book it in your diary now – Thursday 20 March 2014, 4.30 – 7 pm. Bring your friends and family and join us for dinner!